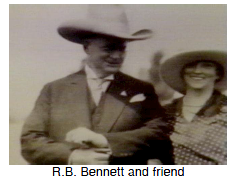 Prime Minister R. B. Bennett tried to solve the problems of the depression at first with economic nationalism. He negotiated new trade deals with other Commonwealth countries and used the federal treasury to buy prairie wheat. 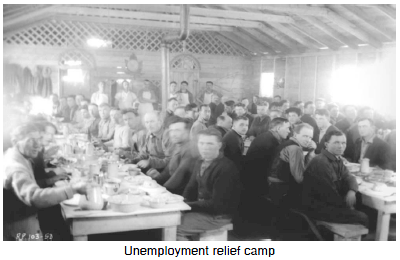 He also set up unemployment relief camps (under the Department of National Defence) and gave some federal handouts to the provinces. Late in his term, Bennett was converted to the idea that the federal government had to establish certain national social programmes to help people. He drafted a number of bills on exports, agricultural loans, minimum wages, working hours, unemployment insurance and business practice legislation. provincial jurisdiction: authority, power or control.jurisdiction, they were acceptable under the BNA Act because they were necessary for "peace, order and good government" - a federal: having to do with the central, national government. For a definition of a federal system of government see "federal union. "federal power. Unfortunately, the British Judicial Committee of the Privy Council, which ruled on our constitutional issues, found that these proposed measures were an invasion of provincial powers and wouldn't allow them to be passed. It was left to the next Prime Minister, Mackenzie King, to figure out a way of bringing in national social policies "through the back door."